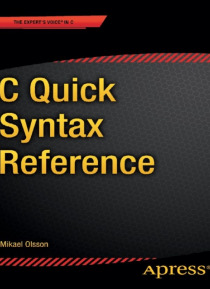 The C Quick Syntax Reference is a condensed code and syntax reference to the popular C programming language, which has enjoyed some resurgence of late. C's efficiency makes it a popular choice in a wide variety of applications and operating systems with special applicability to, for instance, wearables, game programming, system level programming, embedded device/firmware programming and in Arduino… and related electronics hobbies. This book presents the essential C syntax in a well-organized format that can be used as a quick and handy reference.You won’t find any technical jargon, bloated samples, drawn out history lessons, or witty stories in this book. What you will find is a language reference that is concise, to the point and highly accessible. The book is packed with useful information and is a must-have for any C programmer.In the C Quick Syntax Reference, you will find a concise reference to the C language syntax. ; short, simple, and focused code examples; and well laid out table of contents and a comprehensive index allowing easy review.